CHS-2 is a two-way bass-reflex design. 6 1/2 inch paper/Kevlar cone bass-midrange has a rubber surround and dust cap, cast aluminum frame and magnetically shielded motor system. The tweeter is a soft dome design that employs a catenary profile dome, vented pole, ferrofluid cooled voice coil and magnetically shielded motor system. 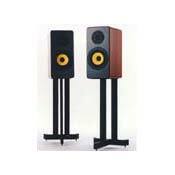 Full spectrum of sound reproduction (treble, mids and base), 3D sound presentation. These speakers perform well even with bad recordings. No grills. The dealer had to ordered them from the manufacturer. This is a review for Cliffhanger CHS-2 / W2 speaker combo. These speakers are excellent. You get the full spectrum of sound (not like most of the speakers out there where you get treble and mids, but no base). The sound that these speakers produce is just amazing. It’s 3D like. It is as though the music surrounds you. The only speaker with similar sound reproduction are Vandersteen 2Ce – 3A, but when I was auditioning them, they were hooked up to electronics that was ten times more expensive then mine (I have Jolida JD1501A integrated amp), and Vandersteen speakers are bulky and ugly. I consider myself a stereophile, and even though I do not know all the cool lingo that “stereophiles” use, this is how you can distinguish good sounding speakers from the average ones. Take several of your CDs with different kind of music to a store where they sell Grado headphones (125 version or higher). Listen to your CDs. Now check what pair of speakers can match the sound (quality, instruments you couldn't heard before, dimensions) that you’ve heard through the headphones. I guarantee that Cliffhangers CHS-2 / W2 will be on the top of your list. You can read a review for these speakers at http://www.soundstage.com/revequip/das13.htm and get some specs at http://www.audio-ideas.com/reviews/loudspeakers/cliffhanger.html. To the manufacturer of these speakers – get you web site going. People need to know about your great products. Pete, Catmando and the others are right...these guys are rude and not helpful. I had to hang-up on Ian when I called just to ask a simple question...he was that rude. Their speakers may sound great but I will not support this company. Using the CHS-2 W2's and just love them. I highly recommend them to anyone looking for speakers in the 2-5K range. To the 3 previous reviewers: shame on you for reviewing a product you haven't tried or even seen! Ian is a great guy who is very kind to people who are kind to him. try pulling up their web-site. out of business? gee, poor customer service didn't have anything to do with it, did it? These guys are just plain rude...I will not buy a product from a company that treats people like dirt...do yourself a favor and look elsewhere. If you have a problem with one of their speakers they will ignore you. STAY AWAY!! rate it at 5 stars for the following reasons: excellent dynamics, transparency, soundstaging, imaging, tonal balance and overall natural musical sound reproduction with smooth detailed highs, natural and musical midrange and powerful solid bass. I am getting great results using a Plinius 8150 integrated amp and an Audio Research CD-2. Quality of components and craftmanship is first rate. The chief designer, Ian Smith, is a wonderful and talented individual who in my opinion has made only one serious mistake with this speaker system: pricing it at less than half of what it is really worth! Both my ears and my wallet can't thank him enough!!! Like Ramon and Nick said in the previous reviews, these speakers are way too good for the price that Ian is selling them for. I listened to the CHS-2's with the W2's and was just blown away that these sounded this good for so cheap. If you like quality workmanship (real wood veneer) and speakers that make it easy to sit down and just listen for hours, these are for you. If you are lucky enough to be able to get your hands on a set of these you will be so happy with your purchase. If there was a value rating of 6, this speaker would get it.